A dominant force in British Flat racing and one of the all-time greats. Champion trainer ten times and the only trainer in the 20th century to win an English Classic in five successive seasons. He claimed his fifth victory in the Investec Derby with Workforce in 2010 who went on to win the Qatar Prix de l’Arc de Triomphe in Paris that season. 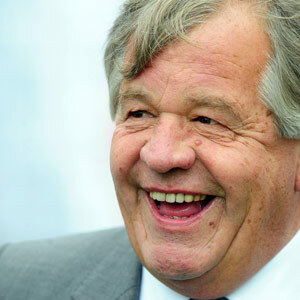 Stoute has won all the English Classics – a collection completed with the 2008 Ladbrokes St Leger, via Conduit – as well as top races all over the globe, including the world’s richest horse race the Dubai World Cup, the Breeders’ Cup Turf, the Japan Cup and the Hong Kong Vase. He was last crowned as champion trainer in 2009, with no little thanks to Conduit, Tartan Bearer and Ask, who pulled off a rare clean sweep in the King George VI and Queen Elizabeth Stakes, a race he won again in 2010 with the brilliant Harbinger. Shergar, the runaway 1981 Derby winner who was later stolen and never found, was one of his best horses. Stoute also switched codes to train Kribensis over the jumps – the grey became the only winner of the Fighting Fifth Hurdle, the Christmas Hurdle and the Champion Hurdle, known as the Triple Crown of Hurdling, in the same season. The Queen is listed among his stellar owners. He was knighted in 1998, not for racing but for services to tourism in Barbados, where he was born and where his family have been based for 300 years. He is a massive cricket fan and a friend of Michael Holding, the former West Indies fast bowler and horseracing enthusiast. After a dearth of Group 1 winners for a few years, he won the Gold Cup at Royal Ascot in 2013 with Estimate, owned by the Queen, and followed with third place with Hillstar in the Betfair King George. He also won two Group 1 races in the USA in 2013, courtesy of the top class filly, Dank. They were the Beverly D. Stakes at Arlington in August and the Breeders’ Cup Filly & Mare Turf at Santa Anita in November. He won his second QIPCO British Champions Series race in 2014 with Gospel Choir in the Sky Bet Yorkshire Cup and just missed out with Estimate in the Gold Cup, who was denied a repeat victory by Leading Light by just a neck. But he made up for that when saddling Integral to win her first Group 1 race in the QIPCO Falmouth Stakes and he then saddled Telescope to finish second in the QIPCO King George before third place in the Juddmonte International and Estimate was runner-up in the Weatherbys Hamilton Insurance Lonsdale Cup. Next time Estimate won the Socialites Electric Cigarettes Doncaster Cup. In 2015, he struck with Snow Sky in the Betway Yorkshire Cup, who also won the Hardwicke Stakes at Royal Ascot. Cannock Chase won him a valuable Grade One prize in Canada. Stoute failed to achieve a Series win in 2016 but it has been a different story in 2017. Ulysses has won the Coral-Eclipse and Juddmonte International for him, while Dartmouth hit the target in the Yorkshire Cup.